The Eden indoor litter bin has a smooth chrome top and a sack retention feature so the litter stays within the waste container. Ideal for internal areas around colleges and communal areas. Clearance offer only available when ordering this product in the Light Green and Dark Grey colour option. Talk to us today! * Limited time only, while stocks last. Selected items marked down on site. Not to be used in conjunction with any other offer. 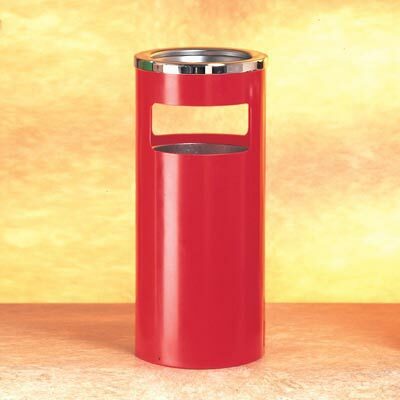 Eden is a colourful litter bin available in a wide choice of colours to best suit your needs. The attractive and stylish design allows this litter bin to integrate with any modern or contemporary locations. The Eden litter bin features two wide apertures to encourage use and decrease littering in internal environments. The small, space-saving footprint ensures that this litter bin can be sited in compact areas for a sophisticated solution to waste. Choose between a smooth, chrome top and a domed top to conceal waste within the container. Optional cable fixings ensure that the top remains attached to the container when emptying and cleaning. Bin: Red, Yellow, Dark Blue, Deep Green, Light Grey, Black.